The slimmer TVs become, the more difficult it is to squeeze decent speakers inside them. The result is that while picture quality has improved in leaps and bounds, built-in TV sound quality has, if anything, probably got worse. Onkyo reckons it has the (albeit not unique) solution with its range of two new Envision Cinema Soundbars and an innovative all-in-one TV-base speaker system. 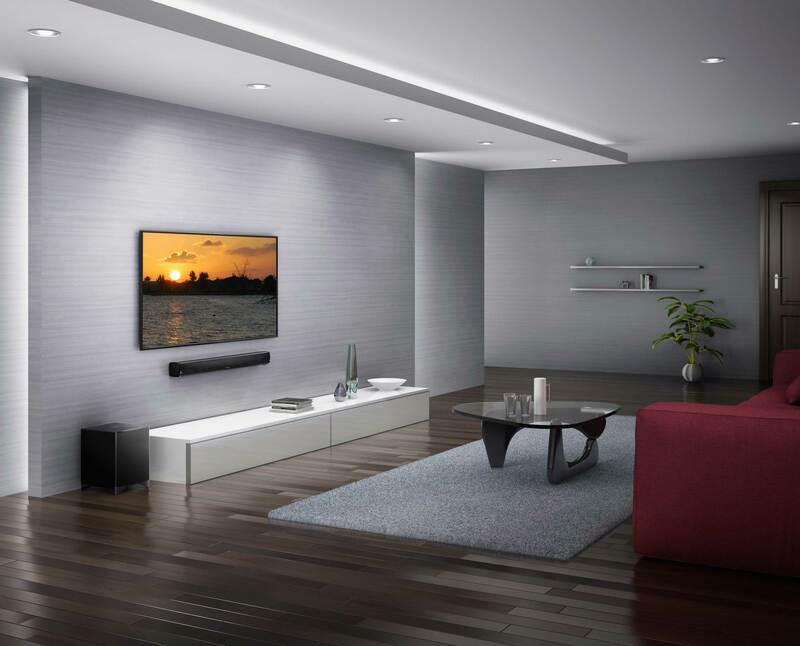 The LS-B40 is a three-way Soundbar, the LS-B50 is a two-way Soundbar with wireless 40w subwoofer, and the LS-T10 TV speaker system is a multi-channel, multi-speaker array with powerful DSP to fill rooms with panoramic, immersive sound. As well as boosting audio quality from TV, gaming consoles, and media players, these audio systems are, Onkyo claims, simple to set up. All require just a single digital cable to connect and are operated using a normal TV remote controller (they come with pre-programmed infra red codes for nine TV brands and learning ability for others). They also double as home hi-fi systems with Bluetooth technology for wireless audio streaming via mobile and PC. USB ports are also included to play audio from flash-memory-based media players such as smartphones, tablets, and mass storage-class devices. For expansive sound in the living room, bedroom, or kitchen, both the Soundbars pack eight drivers (six full-range drivers and two ring-radiator tweeters for the LS-B50, and two bass woofers, four mid-range drivers, and two tweeters for the LS-B40) into very compact dimensions. The LS-T10, meanwhile, features a total of six full-range drivers plus an integrated 21w subwoofer on its underside, and is designed to slip neatly underneath a television. All three models feature an efficient six-channel digital amplifier with audio output controlled by Onkyo’s AuraSphere DSP circuit. Onkyo claims clever algorithms for equalisation and sound pressure level management create a realistic 3D immersion field from either regular PCM stereo or Dolby Digital sources. Three sound modes optimise the playback of different types of TV content, with News Mode cleaning up and projecting dialogue more intelligibly, Movie Mode shaped for greater realism and impact, and Music Mode equalised for a more balanced and engaging listen. The LS-B50 adds a separate wireless 40w active subwoofer for deep-reaching bass impact from almost anywhere in the room, while the LS-B40 incorporates two bass woofers and a subwoofer pre-out. Supplied wall-mounting kits and IR flashers enable flexible placement.